One of the most interesting attractions on Isla de la Juventud is the Presidio Modelo (Model Prison) located 5km east of Nueva Gerona. It was built between 1926 & 1931 and was designed on the model of the penitentary at Joliet Illinois in the United States -- on a "panopticon" plan that called for circular buildings that put prisoners under constant surveillance. The prison was designed to house 6,000 inmates in four 5-story circular buildings. Often, many more prisoners were crammed inside. At the center of each rondel was a watchtower, with slits for viewing the prisoners. Guards could enter and leave the watchtower through underground passages and thus never came in direct contact with prisoners. A fifth circular building in the middle housed the mess hass, dubbed "The Palace of 3,000 Silences" because all talking was forbidden. Prisoners transferred to the mess hall also through underground tunnels so a prisoner had no opportunity for escape. The last prisoner went home from the Presidio in 1967 and only the shells remain. 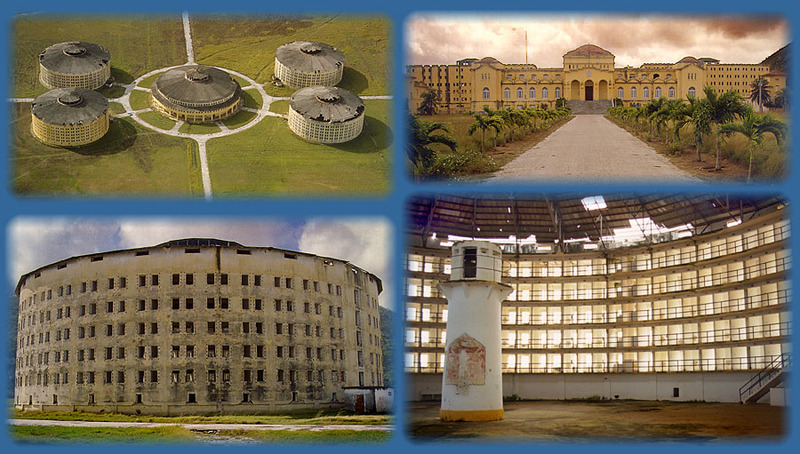 Two oblong buildings at the prison (top right photo) have a very special place in Cuban history. It was here in 1953 that Fidel Castro and 25 other revolutionaries were imprisoned following the attack on the Moncada barracks. Batista foolishly allowed Castro to set up a revolutionary school -- the Academia Idelogica Abel Santamaria -- where the group studied revolutionary theory and guerrilla tactics. Castro and the revolutionaries were released on May 15, 1955. The Academy and revolutionary cells have been preserved as a national monument. For those who wonder how I managed the aerial photo the answer is simple. If you sit on the left side of a departure from the airport at Nueva Gerona (easterly wind), you will generally pass directly over the prison on your way to Havana.